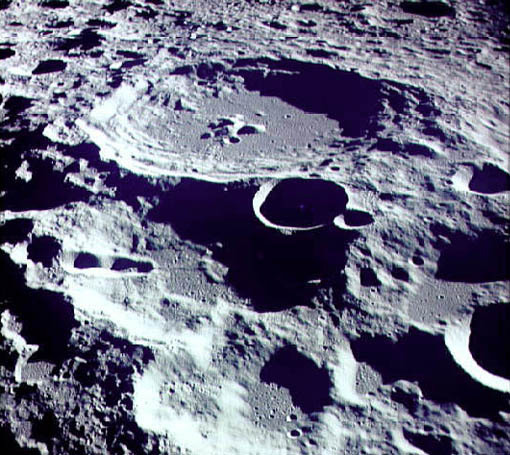 The current story of the surface of the Moon is that of a heavily cratered surface. From the nature and appearance of these craters we can piece together part of the story of the Moon's history. 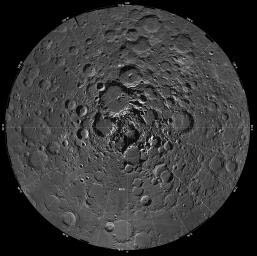 At left above is an image of the South polar region of the Moon constructed from about 1500 Clementine images. The projection is orthographc, centered on the south pole. The Schrodinger Basin (320 km in diameter) is located in the lower right of the mosaic. Amundsen-Ganswindt is the more subdued circular basin between Schrodinger and the pole. 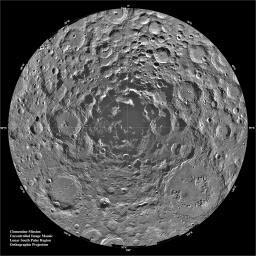 The polar regions of the moon are of special interest because of the postulated occurrence of ice in permanently shadowed areas. The south pole is of greater interest because the area that remains in shadow is much larger than that at the north pole. 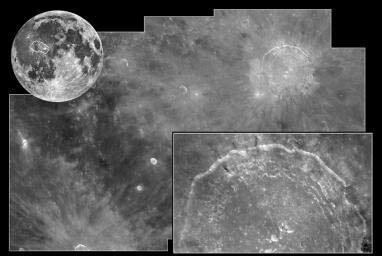 At right above is a similar lunar mosaic of ~1500 Clementine images of the north polar region of the moon. The projection is orthographic centered on the north pole. 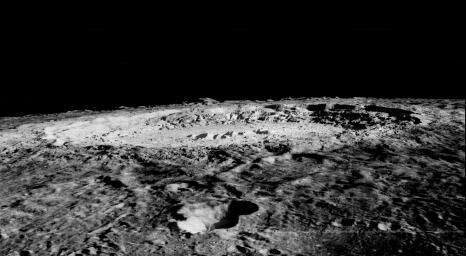 The north pole of the moon is absent of the very rugged terrain seen at the south pole. These descriptions are excerpted from the original NASA captions released with the images. Hubble Shoots the Moon. Views of the Copernicus impact crater. NASA's Hubble Space Telescope was aimed at one of the Moon's most dramatic and photogenic targets, the 58 mile-wide (93 km) impact crater Copernicus. The image creation date is listed as April 16, 1999 and the instrument was the Wide Field Planetary Camera 2. 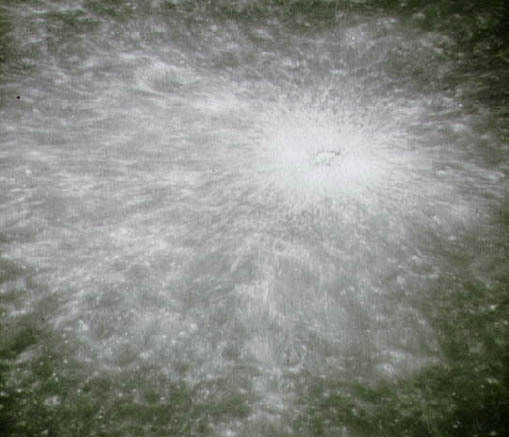 The image was taken while the Space Telescope Imaging Spectrograph (STIS) was aimed at a different part of the moon to measure the colors of sunlight reflected off the Moon. Hubble cannot look at the Sun directly and so must use reflected light to make measurements of the Sun's spectrum. Once calibrated by measuring the Sun's spectrum, the STIS can be used to study how the planets both absorb and reflect sunlight. The Moon is so close to Earth that Hubble would need to take a mosaic of 130 pictures to cover the entire disk. The upper left picture is a ground-based one from Lick Observatory. It shows the area covered in Hubble's photomosaic with the Wide Field Planetary Camera 2. In the center image, Hubble's crisp bird's-eye view clearly shows the ray pattern of bright dust ejected out of the crater over one billion years ago, when an asteroid larger than a mile across slammed into the Moon. Hubble can resolve features as small as 600 feet across in the terraced walls of the crater, and the hummock-like blanket of material blasted out by the meteor impact. The lower right image is a close-up view of Copernicus' terraced walls. Hubble can resolve features as small as 280 feet across. This description is excerpted from NASA's original picture captions. Further image credits listed: PHOTO NO. : STScI-PRC99-14 Credit: John Caldwell (York University, Ontario), Alex Storrs (STScI), and NASA.